Personalized Halloween bags and photo frames to help you enjoy your Halloween Trick-or-Treat fun. 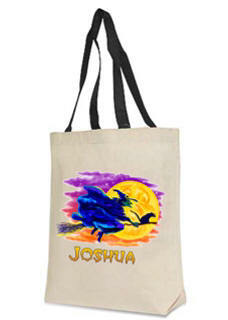 Our personalized Halloween bags feature full color graphics with the child's first name if desired. Our hardwood Halloween photo frames are a great way to display your favorite baby's first or Halloween celebration photo. This natural canvas tote bag with black handles measures 15in x 14.5 in x 3 in. and makes it the perfect size for the little trick or treater. It features a full color 'Scary Pumpkin' graphic with the child's name in a scary Halloween print if desired. 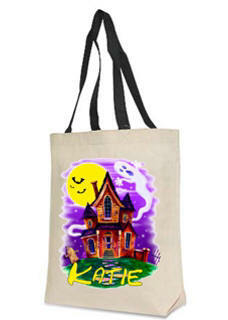 This natural canvas tote bag with black handles is the perfect size for the little trick or treater. It features a full color 'Haunted House' graphic with the child's name in a scary Halloween print if desired. She has her costume, now she just needs her trick or treat tote. 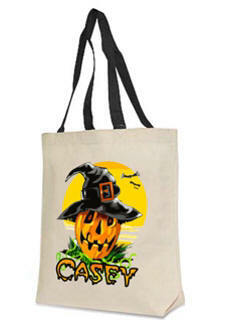 This natural canvas tote bag with black handles is the perfect size for the little trick or treater. It features a full color 'Flying Witch' graphic with the child's name in a scary Halloween print if desired. This personalized My First hardwood photo frame is available in 4x6, 5x7 & 8/10. It features a cute orange pumpkin and white ghost graphics with your child's name personalized on the bottom. 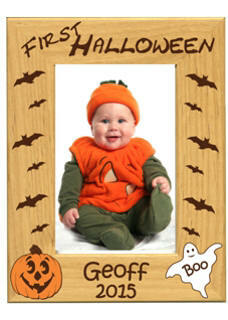 This hardwood Halloween photo frame is available in 4x6,5x7,8x10 sizes. You can put the year or a line of text of your choice for a fun personalized Halloween photo frame. These Halloween frames make a great way to display that favorite photo of this year's Halloween party celebration.